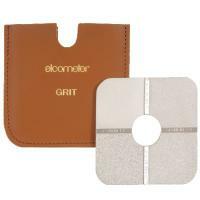 These extremely durable comparators allow the estimation of surface roughness of either grit and shot blasted surfaces. Using the Elcometer 125 Surface Comparators as a reference, the blasted profile can be compared to the four reference profile grades in each comparator. Profiles are recorded in microns.